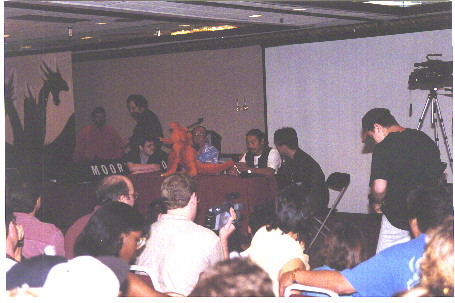 G-Con '96 was held on August 16-18 in Chicago, Illinois. The con was a celebration of kaiju films, especially Godzilla movies, new and old, good and bad. My daughter Sarina and I were only able to go for one day and part of the next, but we had a great time. Featured at the con were Haruo Nakajima, who played Godzilla in 12 movies from Godzilla; King of the Monsters to Godzilla on Monster Island; and Kenpachiro Satsuma, who played Godzilla in the new series of Toho movies, culminating in Godzilla vs Destroyer. 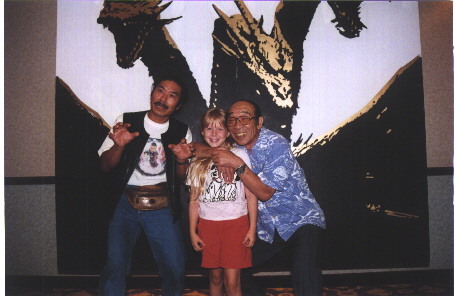 Sarina Winterrowd with Mr. Satsuma(left) and Mr. Nakajima. We unfortunately missed the Kaiju Film Contest, which was held on Friday, but we were able to see the Kaiju Costume Contest and see the wide variety of models and dioramas. There was a dealer area which allowed us to spend way too much money, a question and answer session with Mr. Nakajima and Mr. Satsuma, and rooms showing assorted Japanese films and Godzilla video games. Saturday night concluded with a showing of Godzilla 1985, which turned into a MST3K version as the assemblage added their own (allegedly) witty comments and dialogue. Sean and Sarina Winterrowd model shirts purchased at G-Con '96. All in all G-Con was a lot of fun, and I hope to spend a couple of days at next years con. In addition to meeting Mr. Nakajima and Mr. Satsuma, I managed to pick up several tapes, including a subtitled version of Godzilla vs Destroyer, see the models and costumes and schmooze with other Godzilla fans. For more Kaiju information and links to other Godzilla pages check out my Kaiju page. This page is published without permission or association with G-Con '96 or Daikaiju Enterprises. G-Con '96 was presented by Daikaiju Enterprises in association with Club Daikaiju, Digital Daikaiju, Nippon Express and Visagraph Films International. 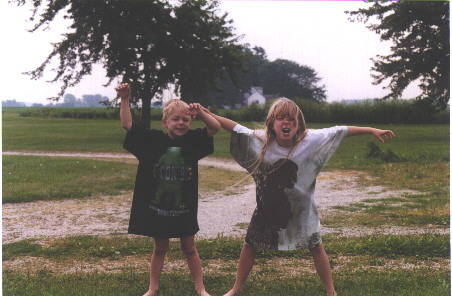 Thank you to Tim and Mona Miller for scanning the pictures.